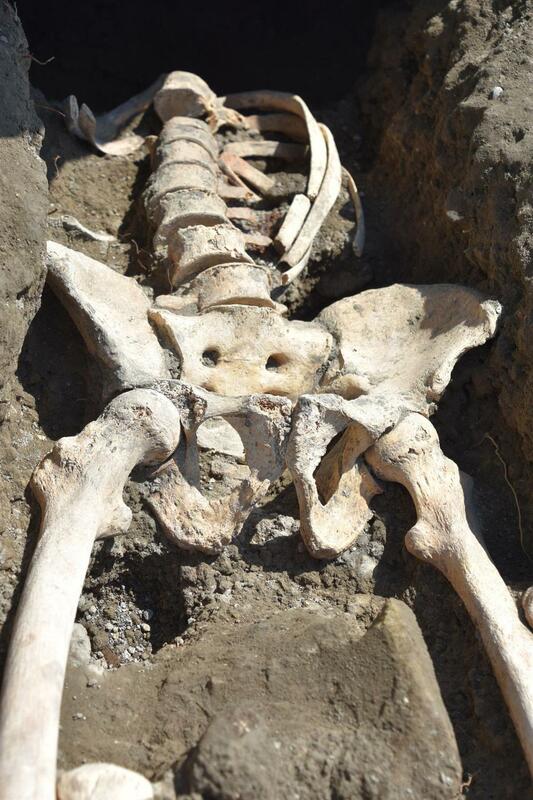 After the discovery of the first complete remains of a horse, the Regio V excavation in Pompeii has unearthed the skeletal remains of a man captured at a dramatic moment of death. 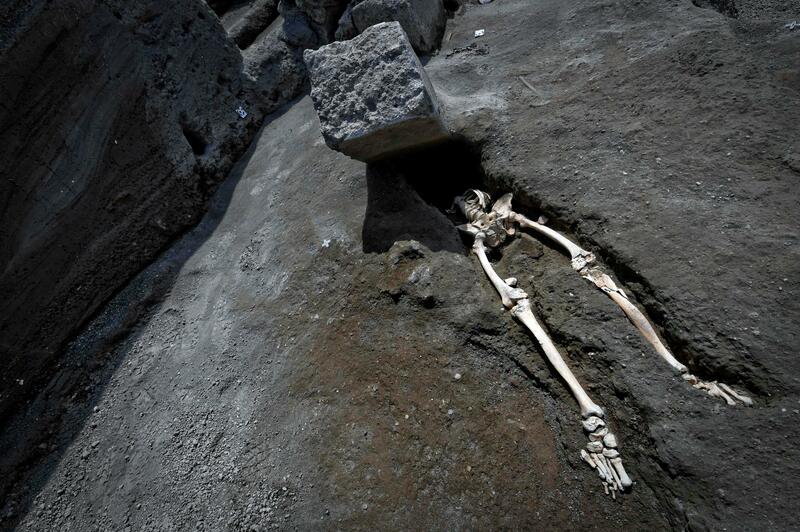 He was attempting to flee the eruption of Vesuvius when he was struck by a massive stone that crushed his thorax and pinned him to the ground for 2,000 years. 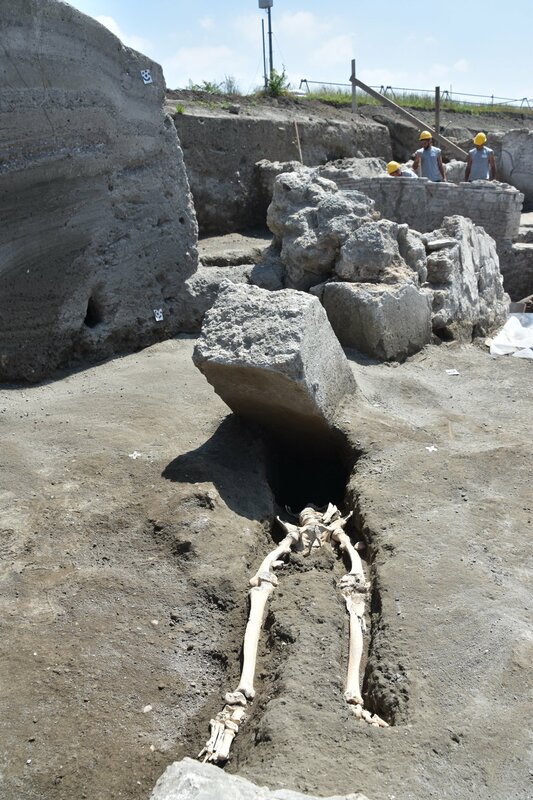 Preliminary examination of the remains and context indicate that the victim, an adult male about 30 years of age, survived the first phase of the eruption in Pompeii, the heavy fall of pumice which caused the death of many of the town’s residents in roof collapses. He took refuge in an alley after the pumice fall had created a whole new ground level. His body was found at at the corner of the newly-unearthed Alley of the Balconies and the Alley of the Silver Wedding, but not at street level. By the time he got to that alley, the thick layer of volcanic stones had raised it to the height of the first floor, about seven feet above street level. His choice of shelter could not shield him from the second phase of the eruption. He was hit by the pyroclastic flow of volcanic gasses knocking him off his feet and throwing him backwards. The gas cloud made a projectile out of a 300-kilo (660-pound) stone, possible a door jam, and shot it at his upper body. The top of his thorax was crushed and his head hasn’t been found yet. Archaeologists believe the remains of the skull, whatever tiny fragments may still exist, are probably under the stone block. Osteological examination on his legs found lesions indicating a serious bone infection. This would have made walking extremely painful and physically challenging. Given his disability, he would not have been able to escape readily on foot in the lead-up to the eruption. This is the first human victim of the calamity discovered in the Regio V excavation. It comes as a surprise to archaeologists because the area has been excavated twice before, once in the 19th century and again in the early 20th, but they missed this man and the stone block that may have crushed and decapitated him before the thermal shock of the pyroclastic flow sealed his fate. “This exceptional find, – declares Massimo Osanna – reminds us of an analogous case, that of a skeleton discovered by Amedeo Maiuri in the House of the Smith, and which was recently studied. These were the remains of a limping individual – he too was likely impeded in his escape by motor difficulties, and left exposed at the time in situ. This entry was posted on Wednesday, May 30th, 2018 at 7:55 PM	and is filed under Ancient. You can follow any responses to this entry through the RSS 2.0 feed. You can skip to the end and leave a response. Pinging is currently not allowed. Just when you think Pompeii has given up all of its secrets. BOOM! Another one hits you. UARGH — that must have hurt! … I wonder, though, if those osteologic ‘lesions’ could be ‘pyroclastically’ inflicted instead of indicating an infection. Even when otherwise healthy, an escape at 700 degrees of heat with a smashed head is unlikely. The phrase “may have crushed and decapitated him before the thermal shock of the pyroclastic flow sealed his fate” might need revision, implying as it does that, had the pyroclastic flow not occurred, he had a chance at life. Not a physician, but pretty sure that decapitation and a crushed skull makes recovery unlikely. …and that ‘menhir’ could certainly be refurbished. Wow. What a way to go. Playing catch with a volcano. This guy is a culture hero. Wonder what is preferable— to die peacefully in your bed and have a respectable funeral, or be blasted away like that and when you are finally found, to have so much WOW made over you. Just a crazy thought….